For the most part, they’re unelected. But they’re given enormous power to determine the outer bounds of the possible – both domestically (under the first ceiling), and internationally (under the second). In a series of blog posts, I’ll be exploring some of the classic writings of the role of judges in our social life, beginning first with good ol’ Adam Smith. Adam Smith was perhaps best known for his theory of the “invisible hand,” which has since been used to celebrate the social-ordering virtues of selfishness. Less well known is his considerable writing on morality, where he argued that “one’s individual merit is contingent and dependent on the happiness and merit of others” (Malloy, 1987, at 229). His 1759 Theory of Moral Sentiments outlines a preliminary model linking civilizational development to judicial-institutional outcomes, which is developed further in his 1760s jurisprudence lectures. His 1776 Wealth of Nations ­builds somewhat on this account by examining the method of financing justice. Smith concludes by noting his disappointment with previous efforts to distill a universal international law of jurisprudence, noting that these efforts have focused more on what good policing (defense) demands rather than what justice demands. He promises to return to this quandary in later work. 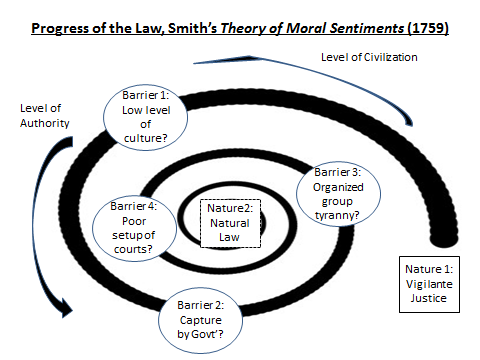 Figure 1 outlines the theory of judicial emergence from Smith’s Theory of Moral Sentiments. The challenge for countries is to move from Nature 1 (i.e. vigilante rule, or rule by baser passions) to Nature 2 (i.e. the jurisprudence that we ought to follow reflecting a perfected state of nature). The tides of civilization and authority take countries ever closer to approximating (but never fully reaching) the ideal of natural jurisprudence. The barriers along the way are represented by the circles, and include alleged cultural, political or institutional deficiencies. [i] Smith would later contrast ethics with jurisprudence by saying that the former is about the protection of imperfect rights, whereas the latter is about protecting perfect rights (i.e. those established by title or law). Next Post Hunt, shepherd, farm, shop – judge?